In the spring of 2013, a national voluntary recycling program will launch. Consumers will no longer have to trash their batteries. This is a win/win for businesses, consumers, and the planet. European Union environmental strategies, policies, and regulations influence environmental decision making in the United States. The EU is guided by a precautionary principle: Prevent harm to humans and to the environment. As a result, the EU has a history of progressive approaches for solving complex-interdependent environmental issues. Environmental stewardship is an integral part of the culture in the EU, influencing citizens, government and corporate actions. However, the US veers toward clear scientific evidence before taking action on environmental issues. When a US manufacturer wants to sell consumer goods in the EU, an issue arises. The US manufacturer must meet different and often competing environmental standards. What is burdensome are the cost and legal complexities associated with disharmony in environmental standards. Alkaline batteries contain magnesium; they may contain higher toxic chemicals such as mercury, lead, and cadmium. These "endocrine disruptors," may interfere with the body's endocrine system. They can produce adverse developmental, reproductive, neurological, and immune effects in humans and wildlife. Despite this, batteries in the US are classified as non-hazardous materials and they are tossed in a person's kitchen garbage can. 3. Producers must pay the costs of collecting, treating and recycling batteries. The Battery Directive advanced Life-Cycle Assessment (LCA) - an analysis for weighing environmental performance and associated costs by examining the entire product life cycle - from cradle to grave. 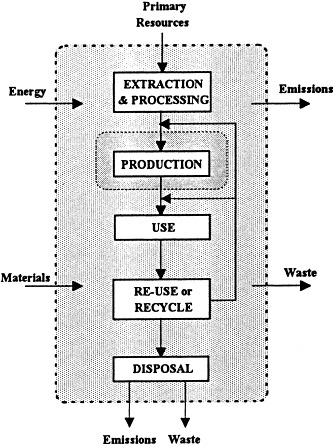 "Cradle-to-grave" begins with the extraction of materials to create the product, leading to manufacturing, use, and end of life (disposal). LCA is an excellent tool for estimating the cumulative environmental impacts resulting of the entire life cycle because of its focus on raw material extraction, material transportation, and ultimate product disposal often ignored in traditional analysis. A recent MIT life cycle battery analysis of household batteries demonstrates that recycling (rather than disposal) yields a higher environmental impact. MIT LCA showed that the most significant impact to the environment occurs in the production stage: Mining and refining of raw materials, battery manufacturer, distribution, and packaging. In comparison, the end of life stage had less environmental impact. End of life stage includes collection, transportation, process, and recovery of materials for use and disposal through landfills. The LCA informed decision-makers that the use of recovered materials (zinc, magnesium and steel) in batteries (to avoid virgin extraction) yields the most environmental and economic savings. So does streamlining the collection and transportation of recycling. The EU position coupled with the MIT LCA analysis, brought together Energizer, Kodak, Panasonic, and Rayovac, the largest battery manufactures in the US, to examine opportunities for a voluntary nationwide program to recycle batteries. Over 70 experts from around the world participated. In 2013, consumers must do the right thing and choose to recycle batteries as part of the largest voluntary program. Annually U.S. consumers purchase over three billion household batteries - think of all the toxic chemicals that will not enter our air, water, and land and the energy and raw material cost saved. Get those recycling bins ready! !